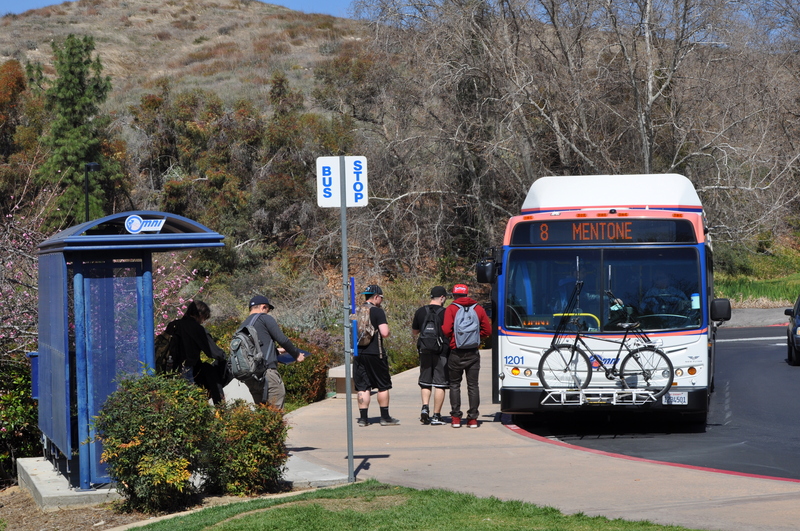 The popular Go Smart program will continue for Chaffey, Crafton Hills, and San Bernardino Valley College students this fall, enabling them to enjoy unlimited bus rides on Omnitrans with their student ID cards. Last spring these students voted to fund the program by assessing themselves a small transportation fee each semester as part of their regular student fees. A list of currently enrolled student IDs is provided to Omnitrans by these participating colleges. Students must contact their college directly if there is a problem with their ID cards. The Art Institute of California-Inland Empire is currently participating in the Go Smart pilot program. Instead of ID cards, students at the Institute must obtain a separate pass from the campus store. Passes from previous quarters must also be renewed at the campus store in order to be valid. If you have any questions about the Go Smart program at the Art Institute, visit Student Affairs for more information. The CSUSB Go Smart pilot program ended on June 30th, and there is currently no program to replace it. If this program is important to you and you would like to see it renewed, please contact Associated Students Inc. (ASI) by calling 909-537-5932 or 909-537-5930. You can also email the ASI at asi-pres@causb.edu or visit them on their Facebook page at http://www.facebook.com/asi.csusb. Thank you for your patience. This entry was posted in Bus Ridership, Go Smart, Student Riders and tagged CAUSB go smart bus, go smart art institute bus, go smart bus chaffey college, go smart bus crafton hills college, go smart college bus, go smart free bus, go smart omnitrans, omnitrans news. Bookmark the permalink. Hey ASI, sorry that the pilot program didn’t work out, but I’m sure you’re working on other great things for your community college!